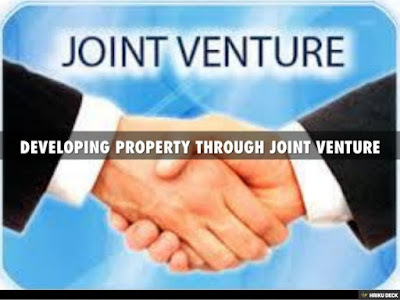 Developing Property through Joint Venture. Urbanization has accelerated migration of people to the nearby cities in search of jobs and other means of livelihood. This increased influx of population to the cities has in turn caused the paucity of residential accommodation. The employees prefer to have accommodation near to their job centers to avoid wastage of time in commuting, resulting in vertical growth of city instead of lateral growth. Vertical growth saves lot of land and can accommodate a number of families in a small space. But, vertical development of land requires heavy investment which in turn has led to joint venture. Joint venture is joining of hands. The words "Joint Venture" is described in the dictionary as "a business activity by two or more people or companies working together".As stated above, vertical development of land comprising number of flats requires lot of money, manpower, expertise, experience, which an individual cannot undertake. Many a time an individual may own some land, but may not have funds to fully exploit it. Similarly a builder developer who has a resource may need some land to employ his resource profitably. Thus, the owner and developer join hands to develop the land. In order to avoid disputes, misunderstandings in working, both the parties reduce the terms and conditions into writing. This is called Joint Venture Agreement.Unlike construction of an independent house, the group housing or construction of apartments is more complicated, requires approval from various agencies like water supply board, sanitary department, power supply board and Airport Authorities, The project requires to be approved by banks for finance. Joint venture agreements clearly stipulate the duties and responsibilities of each of the parties. In order to avoid spending huge amounts for procurement of property, the developers venture into joint development activity with land owners through joint venture agreements, develop the property and hand over certain number of flats to the land owner. The number of flats/apartments given to the land owner depends on the prevailing market value of land in that area at the time of project commencement. The developer or builder enters into an agreement with the owner of the land known as Development agreement or Joint Development Agreement or Joint Venture Agreement. An immovable property for development may be either vacant land or land with structures thereon. A developer or builder enters into an agreement with the owner for purchase and development of the land. The development agreement contains obligations and rights of land owners and builder, like obtaining statutory permissions, ratio of sharing the developed property between owner and developer, process of finding prospective purchasers and funding the project, time duration of completion and penalties for violation. What is contained in the J V agreement? The agreement contains the particulars like the commitment of the promoter to construct it as per the approved plan and specifications as approved by the local authority; possession date, price to be paid by the purchaser and the intervals at which the installments are to be paid specifying stage of construction; precise nature of the body to be constituted of the persons who would take the flats; details regarding the common areas and facilities specifying the percentage of undivided interest in the common areas and facilities appertaining to the apartment agreed to be sold; a statement of the use for which the apartment is intended. Copies of the title certificate issued and a copy of the approved plan and specifications, a list of fixtures and amenities including provisions for lifts to be provided for the flat to be sold should be attached to the agreement. A promoter, while he is in possession and when he collects from persons who have taken over flats or are to take over flats sums for payment of out goings, has to pay all out goings until he transfers the property. The outgoings would include ground rent, municipal and other local taxes, taxes on income, water charges, electricity charges, revenue assessment and interest on any mortgage or other encumbrances, if any. One should also ensure that the area of the apartment has been mentioned in the agreement. It is also mandatory for the developer/promoter to convey the land in favour of the society/association of flat owners /condominium /Company within a stipulated time. The development agreement must be in writing and registration of this agreement is not compulsory. If the developer meets the above requirements, he is well protected and can start construction work. But in case the developer commits any breach of the contract, the defence under Sec. 53 A cannot be availed. Apart from equities, the developer would have a right against a subsequent transferee of the property with notice of the developer's right or a gratuitous transferee of the property under Sec. 40 of the TP Act but not against the transferee for consideration and without notice of the rights of the developer against the property. After examination of the property of the land owner, the developer offers to him his offer for development of the property. This offer basically consists of the percentage of the built up area which shall be offered to owner towards cost of the land and the amount of security deposit that will be paid. This security deposit is a refundable advance which has to be refunded back to builder on successful completion of the project. The percentage of area offered to the owner is arrived at after taking into account several factors such as cost of the land, cost of construction, escalation in cost of construction, cost of obtaining approvals for the building, marketing and administrative expenses and most importantly the selling price of apartments in that area.If the offer is attractive, the land owner will give his acceptance and hand over a copy of the title documents to enable the builder to get the same verified by his Advocate. If the builder's Advocate approves the title, a draft copy of the Joint Development agreement laying down the terms and conditions of the development is given to the landowner for his approval who generally get it vetted by his Advocate.If the draft of the Joint Development agreement is found to be okay, the same is prepared and prescribed stamp duty is paid. This agreement is signed by the Builder and landowner and the builder pays the first portion of the refundable advance to the landowner. Along with the Joint Development Agreement, the landowner also gives a Power of Attorney to the Builder to apply for various approvals required for construction and also to sell the portion of the area coming to the Builder's share.All the procedures and formalities and costs for approvals are taken care of by the builder.The Builder then gets the plan prepared by an Architect, taking into account the requirements of the landowner. Once the plan is ready and approved by the landowner, the same is submitted for approval of the Government authorities. After the plans are submitted and approved, the builder takes possession of the land from the owner. At this stage, the balance portion of the refundable advance is paid to the landowner.After taking possession of the land, the builder proceeds to demolish the old building if any and get the site ready for commencement of work.On receipt of the approval, the builder commences the construction and marketing of the project.As and when the apartments falling to the builder's share are sold, the proceeds are received by the builder in stages and the builder will register the apartments in favour of the buyers. Out of the apartments coming to the landowner's share, they may like to retain some apartments and sell the balance. The landowner can decide to sell his apartments initially or sell the same when the building is 50% over or when it is nearing completion or after completion. Based on the requirement, the builder will sell the landowners apartments and pass on the proceeds to the landowner as and when the same is received from the buyers. When the landowners' flats are sold and a payment is received, the landowner will register these apartments in favour of the buyers. On completion of the project, the apartments being retained by the landowner are handed over to him and the advance which was given by the builder at the time of commencement of the project is refunded back.The builder and the land owner will facilitate formation of a Flat Owner Association and hand over the title documents to the Association. executed in favour of the purchaser. Many Joint Venture agreements are supported by Power of Attorney executed by the owner in favour of the developer for the development works and enters into an agreement to sell and a sale deed to the extent of developer's share after completion of the total building. The different methods of exchange of property are Sale, Mortgage, Lease, Exchange, Gift and so on., All these exchanges are liable to general standards of Transfer of Property and contract under the Indian Contract Act, 1872. This has been explicitly expressed in Sec4 of the exchange of property Act, which expresses that, "The Chapters and segments of this Act which identify with contracts should be taken as a feature of the Indian contract Act, 1872." 2.When understanding gets to be contract? 3.What is the impact of understandings made not as indicated by the law? The expression "understanding" has been characterized in Sec 2(C) of the Indian contract Act, 1872 as, "Each guarantee and each arrangement of guarantees, shaping the thought for one another, is an assention". 3.Acknowledgement of time banished obligation. 3.Are not precluded by any procurements of law. The age of majority of any individual is 18 years under the Indian Majority Act. If there should arise an occurrence of a man is experiencing any mental illness amid specific interims of time, he or she can go into an understanding amid the time such individual is of sound personality. Presently the inquiry that emerges for thought is if individual is plastered or inebriated because of medications would he be able to go into an assention. In this sort of circumstance, if the inebriated individual is in position to comprehend and value the advantages and disadvantages of terms and states of the understanding, there is no bar for the plastered individual to go into an assention. In any case, if there should be an occurrence of any question, it must be built up as per the general inclination of the court that the individual experiencing mental malady, under inebriation was in a position to comprehend the terms, upsides and downsides of assention. Another necessity for a man to go into an understanding is that, such individual ought not have been precluded by any law in power like bankruptcy Act. The gatherings to the assention ought to have consented to the terms with free Consent. Any agree is said to be free, when it is not given under. On the off chance that Consent is given under by any of above components then the understanding or contract gets to be voidable. The impact of voidable contract is the agreement gets to be enforceable just at the choice of the parties whose assent has been taken by compulsion or undue impact or extortion or distortion. Under voidable contract if any property is sold, the buyer gets a legitimate title so long the agreement is not crossed out on the ground that agreement is voidable. On the off chance that the thought and question of agreement is not legal, then such understanding gets to be void, Contracts or unlawful contracts u/s 23 and 24 of the Indian Contract Act. On the off chance that any property is sold under void or unlawful contract, then buyer would not get substantial title to the property. Void contracts are not enforceable. Outcomes of void, voidable or illicit contracts. On the off chance that an agreement is announced as void, the transferee of property would not get legitimate title to the property, the position of gatherings is similar to as though they are not went into the agreement by any means. In this manner realestate of the agreement Act, the gatherings are at risk to give back the points of interest they have taken under void contract. •In the instance of private property, the repatriation of offer continues is limited to not more than two such properties. •In the instance of the offer of an unfaltering property, other than a horticultural area/homestead house/manor property in India by a NRI or PIO, repatriation of the deal continues outside India (counting credit to RFC, NRE or FCNR Accounts), is permitted. •Sale continues of any steady property acquired by NRI/PIO from a man occupant in India may be transmitted abroad yet the sum not to surpass USD one million, per timetable year subject to generation of narrative confirmation in backing of legacy and Tax freedom authentication/no complaint testament from Income Tax power to approved merchant for settlements. •The RBI has additionally now allowed approved merchants to permit the office of repatriation of assets by NRI/PIO in their Non-inhabitant Ordinary Rupee (NRO) Account up to US $ 1,00,000 every year speaking to the deal continues of the ardent property held by them for a time of at the very least 10 years subject to installment of the pertinent assessments. Denial on obtaining or exchange of ardent property in India by subjects of specific nations. No individual being a national of Pakistan, Bangladesh, Sri Lanka, Afghanistan, China, Iran, Nepal or Bhutan without former authorization of the Reserve Bank might procure or move unfaltering property in India, other than lease, not surpassing five years. •NRIs and PIOs may gain any enduring property for private/business purposes in India, other than rural/estate/ranch house, without the consent of Reserve Bank of India. •No statement is required to be made to the RBI. Just data with respect to points of interest of the property and expenses brought about ought to be given to the RBI. This will help at the season of repatriation. •No consent from the RBI is required to exchange any unfaltering property other than the rural area or ranch property or a homestead house in India by method for deal to a man inhabitant in India. •The lock-in time of 3 years has been done away with. •If property has been obtained through NRE account then repatriation is permitted just for 2 private properties. •NRI/PIO is allowed to exchange by method for home loan his private business property in India to an approved merchant/lodging account organization in India. •Sale continues of any steady property in India acquired, by a man occupant outside India (i.e. NRI or PIO or remote national of non-Indian cause inhabitant outside India), from a man occupant outside India can't be repatriated by him or his successor without former authorization of the RBI. •NRI/PIO can lease the private/business property acquired out of remote trade/rupee reserves. •The buy thought ought to be met either out of internal settlements in outside trade through typical managing an account channels or out of assets from NRE/FCNR records kept up with banks in India. •No assessments to be paid while buying property. Karnataka enrollment rules 1965 has created a methodology for gathering activity of the enlisting officer at individual living arrangement. The important standards are explained in part ten and underneath guideline nos. 56 to 32. Any application for participation at individual home should be in composing and should be marked by the one that demands the participation in his living arrangement might be in composing and must be marked by the one that demands the participation at his home. Such letter could likewise be given by some person to the enlisting officer. The solicitation must be conformed to as ahead of schedule as potential. In the event that such participation at individual habitation exasperates the normal routine of the working environment or needs conclusion of work environment and if the case doesn't be section31 of the Indian Registration Act, a commission could likewise be issued, which recommends someone else separated from the enlisting officer could likewise be asked for to go to the individual living arrangement and complete the enrollment conventions. The gathering activity of sub-enlistment center at individual living arrangement or procurement commission must accord to the recorder inside twenty four hours. The Sub-enlistment center might not continue out of his sub locale for this reason; however recorder could go to the individual living arrangement situated in his region however' it ought not be situated inside the sub area beneath his prompt charge. The magistrate named to go to the individual living arrangement can give evidence and thusly the enlisting workplace can analyze the official in individual in his office joined with release of his bonus and willful nature of affirmation of execution. Over the span of gathering activity if the enrolling power must record the affirmation or execution of persons not exempted from individual look in admiration of a proportional archive dead by somebody exempted from individual look, the enlisting power could suits the solicitation gave gathering activity expense is demanded. Section88 of the Act alludes to archives, that are executed by Government officers or bound open functionaries who square measure exempted from individual look. Any officer of the govt., any executive general, official trustee or authority party, the law officer, recipient or enlistment center of court, any holder of such option Court, any holder of such option office as is informed inside of the official Gazette of the administration square measure absolved from individual look or through their specialists in reference to enrollment of any instrument dead by them or any report dead to support them in their official ability. They're also exempted from dialect the report for conceding the execution as required underneath section58 of the Act. At the point when archives square measure sent by government officer with an introductory letter expressing that reports dead by him be enrolled, the introductory letter are abundant to fulfill the validity of the mark of the executants. On the off chance that such report is offered by a non-open gathering, who is also a festival to the record, the enrolling power can fulfill on the validity of the mark by a short enquiry. the real certainty of exception from individual look and presentation of the archive by introductory letter are upheld. a)Every officer allowing an advance beneath Land Improvement Loans Act 1883. Every court giving a testament of offer of undaunted property underneath Civil Procedure Code, 1908.
b) Just if there should be an occurrence of advances beneath Land Improvement Loans Act 1883, points of interest of the area to be allowed as guarantee security. c) Each officer conceding advance beneath Agriculturists Loan Act 1884 must forward, a copy of the archive whereby the ardent property is burdened to secure remuneration of the credit and a copy of such request. d) Each Revenue officer, who concedes a testament of offer to the obtaining of enduring property oversubscribed publically closeout. The enlisting officer can document the duplicates of such requests, endorsements, and instruments in book No.1. The included working environments needn't appear eye to eye at enlistment office. +State Government has made tenets on the method of developing duplicates and way of documenting duplicates. Could an enlistment of an archive be guaranteed as an issue of right? Indian Registration Act, 1908, has beneath section17 recommended bound records that are compulsorily enlisted capable and underneath area 18, the archives, the enrollment of that is discretionary. All by itself will anyone claim as an issue of right, enlistment of a report that is required underneath section17 of Indian Registration Act 1908.Vareious States have corrected the most Registration Act and have surrounded principles there beneath. Karnataka Government has embedded a fresh out of the plastic new segment 22-A, with result from 23.10.1976 that engages the administration to boycott the enrollment of bound records as against open approach, by telling in authority journal, and along these lines the enlisting officers might decline to enlist any such report. MUNOMV/2005, date.23/04/2005, has in activity of forces given underneath area 22-An of Registration Act as altered by Karnataka Act 55 of 1976 has proclaimed enlistment of taking after records as against the overall population arrangement. This can be successful from 06/05/2005. 1. Site with or without building in farming land that isn't changed over for non-horticultural reason underneath area ninety five of state Land Revenue Act 1964. 2. Site portrayed as Gramathana site (frame no. 9, 10) or option site proclaimed beneath sort no.19 underneath standards encircled beneath state Municipality Act 1964, however not by any stretch of the imagination recover as site. 3.site on an income area depicted as Gramathana site or option site or a site with an expanding on that no design set up is endorsed and a discharge testament is issued from local concocting power like BDA, BMRDA, BIAAPA, BMIC. 4. site on an income area spoke to as Gramathana site or option site, pads, modern site, mechanical site, while not essential consent underneath segment 79A and 7B filter with segment 109 of state Land Reforms Act. Accordingly the exchange of just the accompanying properties is admissible. a)Properties falling underneath Bruhat Bangalore Mahanagara Palike. d) Properties in formats affirmed by option local concocting powers like BMRDA, BlAAPA, BMIC and so forth. In the introduction the warning, it's express that a ton of properties are enlisted upheld sham and created reports that don't leave this world lawfully flawless title to the purchaser. In a few cases, the horticultural area is exchanged by enlistment as non-agrarian area while not so much transforming it to a non-farming reason as per Section ninety five of state Land Revenue Act 1964 and state area stipend Rules 1989. This has prompted heedless development of city and option urban areas. The Right of Redemption is a key component of home credit and is unavoidable in it. The mortgagor's benefit of recovery is not just a contractual right. It is a legal right given to him by law. The acquirements as for this are contained in Section 60 of the Transfer of Property Act, 1882. - Right to require the mortgagee to pass on to the mortgagor the home advance deed and all documents relating to the sold property, which are in the mortgagee's proprietorship, if the mortgagee is in control of the sold property. - Right to pass on responsibility for to the mortgagor, and at the mortgagor's cost either to retransfer the sold property to him or to any third individual as he may arrange. - Right to execute and to have enrolled an insistence in making that any privilege in trashing of his leeway traded to the mortgagee has been soaked. The benefit displayed by this territory is known as a benefit to recover. A suit to maintain this is insinuated as a suit for recuperation. The mortgagor can rehearse the benefit before it is extinguished by the parties' showing or by the operation of law. The privilege can similarly be smothered by a declaration of court. The mortgagor is not fit the bill for recover before the home advance money is normal that is before the time settled for the portion of home advance money. The rights are at risk to the condition that the rights displayed as above host not been soaked by the gatherings' exhibition or by a declaration of court. The home advance deed may give that the time adjusted to portion of the chief money should be allowed to pass or in case no such time has been settled, the mortgagee may be met all requirements for sensible notice before portion or fragile of such money. It is to be seen that the above statutory obtainments won't not have any kind of effect to recuperation of bit of sold property. The acquirements ought not entitle a man captivated by an offer just of the sold property to re-consider his own specific share just, on portion of a proportionate bit of the aggregate staying due on the home advance. The rights as exhibited above have a spot with and may be approved by the mortgagor or by any encumbrance. Where a mortgagor is fit the bill for recovery, then on the fulfillment of basic conditions, which enable a retransfer, he may require the mortgagee to either retransfer the property to him or as opposed to retransferring the property, to dole out the home credit commitment and trade the sold property to such third individual as the mortgagor may organize. In such a case, the mortgagee ought to be sure to dole out and trade as requirements be. If one of the parties is a minor, name of the Guardian represents him. For the most part the minor is Represented by the Natural Guardian. Details of development installment if any made and method of installment of equalization of offer thought. The certainty of giving over of unique reports of the property alongside conveyance of ownership to the buyer. Indemnifying the buyer if there should arise an occurrence of deformity in the title of the seller. Details about execution of General Power of Attorney if any executed by both of the parties. Permanent Account Number (PAN) of the dealer and the buyer if the deal thought is more than rupees five lakhs. The development rate of the nation's populace is prodigions. The Indian populace develops at an at regular intervals rate of more than ten for every penny, normally needs to locate a relating number of new homes well beyond the current number of habitations of the past ten-year period. Notwithstanding the above center need, no less than ten for every penny of the current number of houses require the requirement for reproduction or substitution, to face the changing tastes of youth who acquire the senior era's homes. These two elements are thought to be great to the development and sustenance of Realty Sector and constitute the backbone of Real Estate Business interest structure. The second element makes next to no interest for extra space. It makes interest for development movement. Old structures are stretched out inside existing area range or crushed and constructed vertically with more space included through the method for improved FSI. Clearly the need of the expanded populace for lodging units makes interest for new land for development. Be that as it may, the accessibility of area for new development has been contracting in the course of recent decades, which drives the Governments to upgrade the Floor Space Index for development in numerous major urban regions. To add to this unavoidable wonder, Governments both at State and Central levels have been insatiably eating up every accessible area under the guise of Economic Development and Industrialization. In the affectionate yearning of creating economical business State Industrial Development Corporations and others of the kind have taken away immense tracts of area out of the business sector, for particular designation to Industries. Disregarding such steady measures, an unconscionably high number of mechanical units are today lying debilitated, with the area and different assets put resources into them getting to be inefficient. Furthermore, a high rate of the created mechanical plots are lying unsold with the enterprises. In the event that the endorsed cost of the plots for apportioning of these plots, one will be asking why these plots are staying unsold. Indeed, even with a traditionalist estimation, it could be said that a large number of hectares of created modern plots in many States are lying unsold, in spite of the reality of incredibly low costs at which these are proposed to be sold.There is something that does not meet the stripped eye behind this strange marvel. There is a solid case for ban on further securing of area for industrialization until all the unmoving plots are designated to meriting units. At that point we are seeing there are the terrains procured for Special Economic Zones and Port Development. The uncommon financial zones have keep running into an aggregate disappointment. All over the place there are emitting disturbances against new land acquisitions. In total, every one of these components join together affecting in the lessening of area accessible for the development of new development on the lodging part. A few genuine steps should be taken to address worries of the subjects about area for their fundamental lodging needs, which stay one of the three essential prerequisites for any person. The reasonable measures as specified above could well make a good circumstance of dialing down the issue of area accessibility for new development. The Policy creators while inspecting and figuring arrangement alternatives, ought to keep in their brains the hobbies of the little merchants and facilitators. Sufficient store area ought to be kept for the extending development of lodging units which needs to coordinate the expanding populace. This will prevent the future issues. Reasonable lodging like social insurance and instruction could be a massive drawback for people with humble implies that and the overall population will be searching for some bearing from the clergyman of money to make lodging less expensive. Typically, resources companies have a readied proposal higher tax benefit for home credits/interest and less assessment for designers. While this can encourage inside of the urban areas, the interest offer element in bigger urban areas is such it may give one more motivation to manufacturers to raise property costs. The Central Government's part is furthermore confined as lodging could be a state subject however the priest of account will give some direction. HDFC Chairman, Mr. Deepak Parekh has been pitching for state level controllers for the world for an extended time. He feels that a controller would have the capacity to screen the sensible lodging motivation, advance resources changes and ensure straightforwardness especially by ordering steps like pads being sold singularly on rug space. Mr. Girish Batra, Chairman and director of Netambit is moreover pitching for a body kind of an advantages administrative organization that may control the imperative bequest part inside of the wake of late organization administration issues. He expects that the lodging division development would be a need to be given financing costs alleviation through banks given the theory and broadened costs that have harmed segment feelings this business. Be that as it may, expenses are high on account of the accessibility interest twin. Enormous developers who have caught the vast majority of the area in gigantic urban communities like Bombay and city are really bulletin arrive that they're keeping for super-premium fragments. In Bombay for instance, the powers and bodies simply like the MMRDA are perched on huge tracts of area and if the pastor of account will make each these substances to spew this area, the expenses of property can beyond any doubt fall. Tart running from post to segment to save their home/level and safe weight and turmoil for no defect of theirs. Remembering the finished objective to save these level/house proprietors from the evil. His flawed property builds, the BBMP, BMRDA, BIAAPA another town orchestrating forces from whom the private property fashioners need to get flexibility should educate in their individual we its the summary of endeavors of private property designers cleared by them. Immediately, the Bangalore Development Authority illuminates me.The recipient site only the once-over of certain unapproved configurations going with it.In this domain, yet have not been instructing the summary regarding approval outlines on their site. The concerned town orchestrating forces may kind I consider telling the summary of insisted outlines similarly on their site. Further, because of space structures, villa made by the private property engineers, it should be made as re-crucial for all these property creators to convey a completion support procured from the proficient force before enrollment on unique deed for the purchasers by the designers. To control these private property architects and to secure the level's eagerness/house buyers, the Union Government has come. With a recommendation for thought by the State Governments to foundation a Real Estate Regulatory Authority to coordinate the rule, arrangement, trade and organization of private structures Apartment structures by the property developers.It is prescribed that the components of the authoritative theory. Consolidate affirmation of the capabilities and the private's points property originators, to make preventive step or non-adherence of statutory necessities, to direct fitting if the money got by the architects from the buyers. The regulatory force may be empowered to begin stringent reformatory movement against the bumbling property engineers. In the course of recent decades the complete globe has been stamped with the extension of area and such associated business. This has come about because of a rapid urbanization strategy and thusly the related changes in exploratory control and demographic profiles. Such a development has without a doubt affected a stable monetary procedure, however bigger bounty still experience the ill effects of moderateness issues and region imperatives. The new thousand years has seen the planet nearly monetary advancement. Furthermore to the get together and creating commercial enterprises, there has moreover been a curiously large blast inside of the administrations division which consolidates exchange, transportation, correspondences, land and fund, open and individual segment administrations. According to the review of the International leading group of area and lodging, area in India has been on the expand and has contributed too about 5-hitter of the national quality. The unfaltering increment inside of the generation of the previously stated part without a doubt reflects swelled business sector decided procedures, similar to the develop of rustic keeping money, advance and loan fees, and temperate area administration to supply for an enhanced usage of area and framework. The worldwide land counseling bunch Knight Frank has stratified India fifth inside of the rundown of thirty rising retail showcases and has expected a considerable 200th rate for the composed retail segment by 2010. Interest in retail land area yields 13-16 % return, that is kind of high when put next with the profits from the private and working environment sections. This is making an enthusiasm inside of the outside players for direct speculation. In order to fulfill the interest of the nation's colossal lodging deficiency, there's a gigantic chance for creating enormous scale modern and private townships the nation over. This would without a doubt support open individual association and India might be changed into a noteworthy destination for speculation of overall capital. Keeping this unmistakable, the govt. has started to assume adaptably as far as lodging guidelines, laws and pointers and diverse speculation issues. According to the standards of the govt. in India, 100 percent Foreign Direct Investment would be permitted out and out assortments of lodging, business premises, inns, resort and so on. This development speculation is relied upon to claim a multiplier element result on changed streets like vocation creation. Building methods and techno-stuporus and assistant commercial ventures of development are underlined. Most importantly, the individual financial specialists amid this part have moreover ended up being gifted and have started to select from a vital level. The institutionalization of commercial ventures of development has furthermore been accomplished through conservative speculation capitalization. The most up to date business sector pattern reflected amid this business is on looking for retail property that has, thus, created a major up-liftment of land worth. Inspite of these components area loaning is considered a hazardous business that has plentiful proofs from a few nations of genuine bank misfortunes. The differed sorts of dangers identified with this business exemplify credit hazard, insurance danger, addition hazard and esteem hazard. Regardless of this, changed nations are urging Foreign Direct Investment to be skimmed amid this segment. This present development speculation is foreseen to possess a multiplier element result on vocation creation, building systems and innovation, also to advancing the assistant businesses of development. The bank's strategies and techniques should typify an examination program that components proficient judgments of the current and/or future worth of the imperative property. The issues that are taken into thought include value, market information, capitalization of monetary profit approach and reduced salary. Purchasing a property requires inside and out information of land and picking the right sort of advances. A few banks are venturing up their introduction to land. These banks are going into concurrences with developers for land advances. The plan primarily takes into account manufacturers/promoters/engineers of land. As indicated by RBI figures advances to manufacturers, alongside retail credit (like home advances, Visas and individual advances) constitute a major piece of banks aggregate advance portfolio. Banks ordinarily give land advances to manufacturers/land designers of notoriety. Experience of 3-4 years are an unquestionable requirement to profit the credit. The quantum of credit is chosen in the wake of investigating the money related explanations and income articulation of the candidate. The greatest measure of credit fluctuates from case to case and from bank to bank. Reimbursement is done in singular amount portion after the fruition of undertaking/offering of the pads. The quantity of portions is confined to 3 to 4. The loan cost is ordinarily decided and charged by prime loaning rate of the bank. Developers can either settle on an altered or gliding rate of hobby. Manufacturers/land designers can top off the credit application either in individual or use online offices and apply for advance. An ostensible handling expense is charged by the banks. 1. Application structure with photo joined thereto. 2. Duplicates of authentications Educational capabilities. 4. Confirmation for presence of business and business profile with most recent three years salary government form. 5. Most recent 3 years pay and consumption proclamation and asset report. 6. Most recent 3 months individual and business bank explanations. Terms and states of credit may differ from bank to bank. Banks give credits against home loan of property. Agents, independently employed experts, salaried persons are all qualified to apply for the advance. It empowers the borrower to apply for credit against a settled resource. Hobby is charged at the foreordained rate according to the terms and conditions. Hobby can be either on altered or skimming rate premise. Loan fee can be reduced for existing customers and in unique cases as indicated by the strategies of the bank. Clients can apply for home loan credits by filling an online structure. They can likewise visit the closest branch of a specific bank. Typically, banks charge 1-2% of the genuine credit sum as handling expense. 4. Most recent pay slip of current dated compensation authentication with most recent structure 16 under Income duty Act, 1961. 5. Evidence of responsibility for resource being sold. 4. Most recent IT return alongside calculation of pay, B/S and P and L alc throughout the previous 2 years appropriately guaranteed by a contracted bookkeeper. 5. Capability evidence of the most noteworthy expert degree.